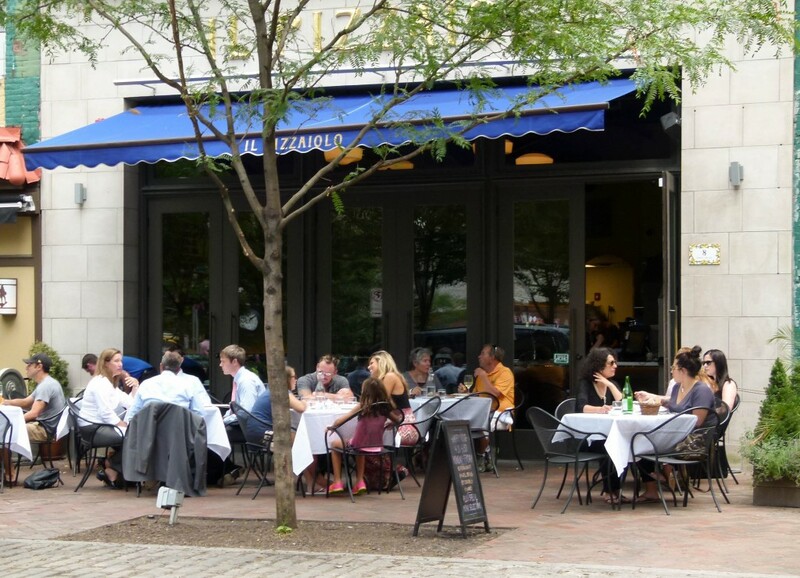 Outdoor seating makes Il Pizzaiolo a superb spot for a casual business meeting or just some people-watching in Market Square. My friend and I visited on a weekday. Most patrons were suits, a demographic more common at the Market Square location than at the Mt. Lebanon location, one of the few differences between the two restaurants. 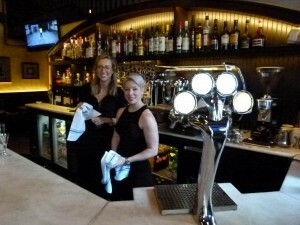 (The Market Square location also serves lunch panini and has an upstairs bar.) A couple lucky to have an afternoon off work were also present, along with, presumably, their young son and daughter. Michelle Montana (l., downtown) and Alena Gusic (r., South Side) pair all beer, wine, and espresso-based drinks with a smile. We walked inside to get a table. The interior evinced cleanliness and upkeep. The white tile floor was pristine, and the high wooden ceiling was unsullied. The layout also demonstrated careful planning prior to the restaurant opening. The brick oven, while the heart of the establishment, did not feel imposing and glowed welcomely in the far left corner, emanating wafts of wood-fired pizza. Opposite it and in the center of the room, colorful liqueurs and spirits stood behind the bar as well as an espresso machine for cappuccinos and the like. Marble table tops and wooden seats made indoor dining an enticing option, but we couldn’t say no to the sunny weather or to people-watching the comings and goings of the Market Square passersby. Once seated outside, my friend and I partook of the complimentary bread and water. The bread was lightly seasoned and came with a side of olive oil for dipping. The water was served in a carafe—classy and practical, as we needed not to rely on the server to refill our glasses. Not that she would have let us down. Like the hostess, she paired all inquiries with a smile. “How is everything?” she would ask after each course, a few times during the meal, and never to the point of ad nauseam. She also possessed that strain of telepathy innate to the best of servers. During the main course, when I received my pizza, I went to ask her for another plate but stopped myself, not wanting to trouble her. From the stifled “Could I?” that managed to escape my lips, she guessed my request, asked if I wanted a plate, and soon returned to our table, extra plate in hand, no trouble at all. 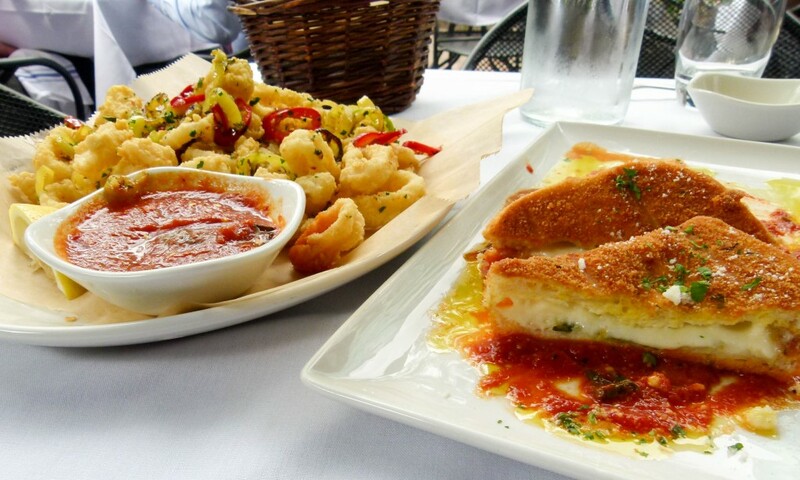 Mozzarella in carrozza (r.) and calamari arrabiata style (l.) makes a delicious pairing of antipastos. Carrozza means “carriage” in Italian. In this case, the “carriages” are filled with mozzarella. But I’m jumping courses. To start, we ordered two antipastos: mozzarella in carrozza ($10) and calamari arrabiata style ($15). When I suggested the former appetizer, my friend’s eyes flashed in recognition. Mozzarella in carrozza was a dish he had been wanting to try, recommended to him years ago by another friend of his. Carrozza means “carriage” in Italian. In this case, the carriages were four triangular wedges of battered bread, each transporting mozzarella. (Taste/texture-wise, think cheese sticks, but for adults.) The appetizer was cooked with pesto, an ingredient which both of us had trouble detecting. But we appreciated how the chef chose to serve the carrozza over a bed of rich marinara rather than drowning the appetizer in the sauce. This culinary choice allowed for better quantity-control. Intrigued by promises of spiciness, we ordered the calamari arrabiata style. Arrabiata translates to “angry” in Italian, though I found the calamari’s mood to be far more multifaceted. The spice immediately jumped my tongue but quickly dissipated, leaving a slow, agreeable afterburn all while preserving the calamari’s taste. Red and yellow banana peppers were sprinkled over the tender squid for an extra kick; a lemon slice provided an optional sour complement. 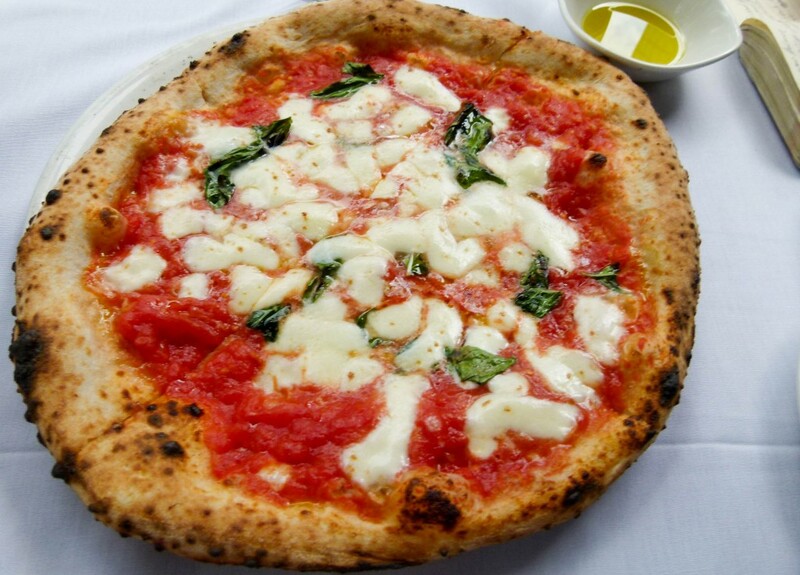 Legend has it that Margherita pizza’s red tomatoes, green basil, and white cheese symbolize the colors of the Italian flag and that the pie was named after Margherita of Savoy, the Queen of Italy. Back to my entrée, a Margherita pizza ($16) specifically. In sliding the slices from the main plate to my extra one, I encountered none of the messiness of lesser pies. Rather, the mozzarella and Pecorino cheese held tightly to the crust, which was done but not overly crunchy. The sauce was pleasant with a slightly sweet side. All of Il Pizzaiolo pizzas are certified Vera Pizza Napoletana, a designation of Neapolitan authenticity given by the True Neapolitan Pizza Association, headquartered in Naples. 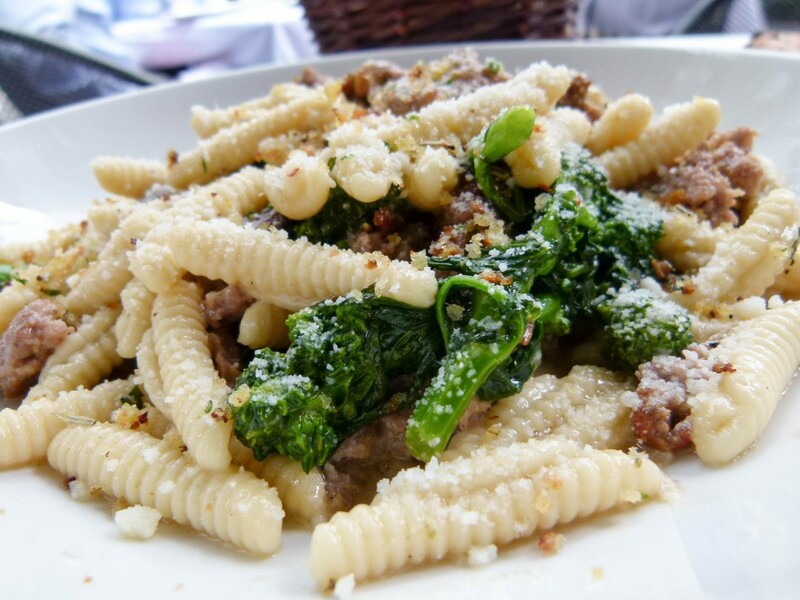 A dash of rapini adds an excellent complement to both the house-made sausage and cavatelli. My friend ordered cavatelli rapini ($21). Cavatelli are small, stocky pieces of pasta. Most noodle dishes are made with fresh, house-made pastas, a few others use pastas imported from Italy. Rapini is a green vegetable that resembles broccoli. “The little bitterness of the rapini gives it a nice interplay,” my dining companion said of his entrée. An Il Pizzaiolo chef, Tony Digristina of Sharpsburg, uses only the freshest ingredients to assemble the most authentic pizza possible. I tried the dish and found the rapini’s taste wasn’t the sole thing contributing to that interplay. The vegetable’s softness, combined with the ridges of the cavatelli and the roundness of the house-made sausage, made chewing an enlightening process, each bite unveiling a new side to the dish’s overall consistency. A hint of fennel in the sausage added to the taste while all ingredients reveled in a delicious sauce of garlic, wine, Pecorino, and olive oil. For dessert, we split a cannoli ($7), which was more than big enough for the two of us. One side was sprinkled with chocolate chips; the other, with pistachios. Hints of lemon skirted the bold vanilla taste of the creamy ricotta filling, and the shell was baked to a perfect hardness. 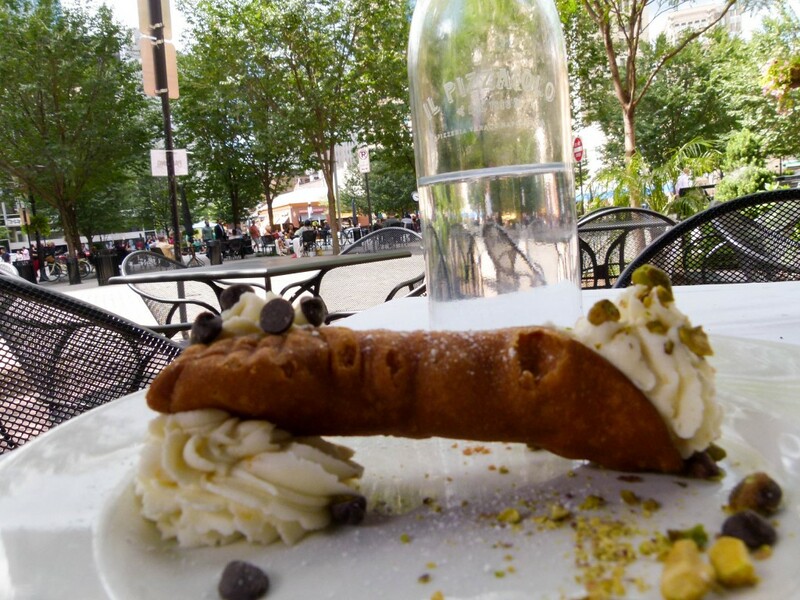 “Take the cannoli.” A dessert perfect for splitting with a date on a sunny afternoon in Market Square. Il Pizzaiolo was born in 1996 in Mt. Lebanon by Pittsburgh native Ron Molinaro. Using only the finest ingredients available, the restaurant quickly built its reputation as a premier dining spot in the Pittsburgh area. 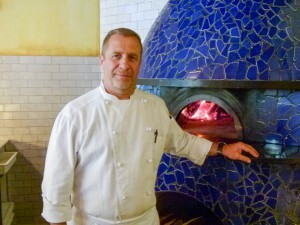 Executive chef Richard Sphatt oversees not only the wood-fired pizza but also the numerous antipastos, pastas, and desserts. “[There are] lots of things in the works,” Sphatt also said of the franchise’s future. Foodies can expect more locations. Potential sites include East Liberty, Lawrenceville, or Warrendale. Until then, be ready for a mobile pizza oven, which will be hitched to a truck. It will join the region’s burgeoning food truck scene and be on-site at major outdoor Pittsburgh events. “We’re going to make a lot of smoke and noise and make some nice pizza events,” Sphatt said. As for Il Pizzaiolo Market Square, we had a very enjoyable lunch. The prices are reasonable for the quality and quantity of the food served, along with the outstanding service. My friend and I foresee it thriving well into the future and look forward to visiting again soon. 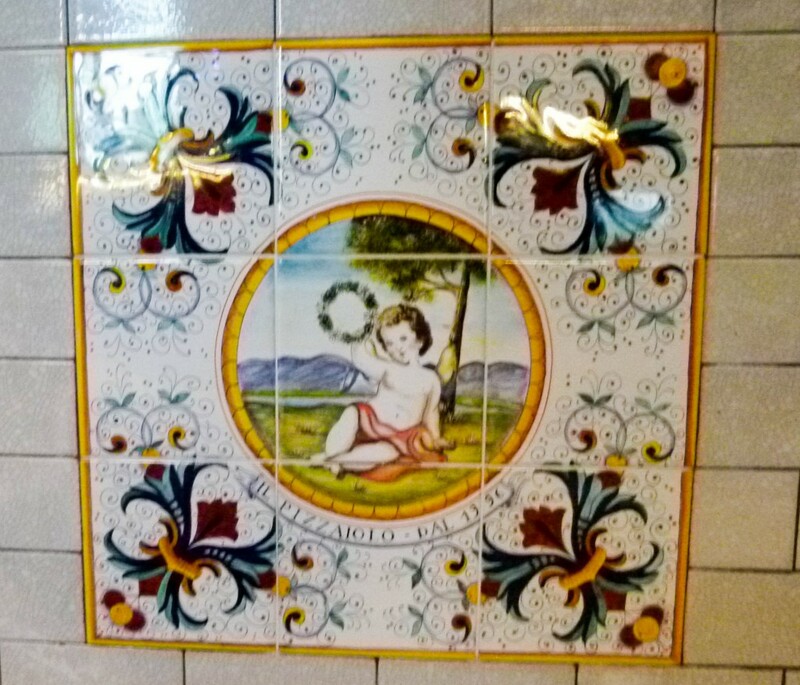 A cherub mosaic makes patrons feel as though they really are in Naples. Open Monday-Saturday 11 a.m.-11 p.m., Sunday 12-9 p.m.
Christopher Maggio is a Pittsburgh-based freelance writer, who loves live music and fine dining.